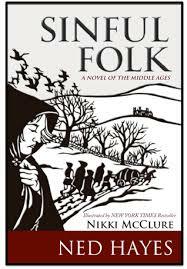 Although I don’t normally tend to go for historical-themed books, when I saw this book originally offered on a Goodreads giveaway, I was drawn to the blurb and the plight the main character, Mear, was facing. Although I didn’t manage to win it on a giveaway, I was able to receive a free review copy of this book another way. I have to say that the cover of this book was particularly striking. I felt it fit in well with the theme of the book, since there was very little colour in the setting they were in. I could also see just how much research the author had put into this book. I felt like I was there with the characters in a way. I liked Mear as a character. I found her really easy to relate to and I strongly empathised with her grief and the way she tried to struggle on through the obvious torments of her past. I did find that a lot of the mystery in this book wasn’t really as explored as it could have been. Despite not having spoken, Mear did come across as quite an intelligent character and I felt it would have been good to see more of her thought processes when she DID receive clues about what had happened. Although there wasn’t much shown about the actual historical figures of this time, it was still interesting to see how the characters were affected by those in noble positions. Some parts of the book were really difficult to read. This novel was set in a vastly different time to nowadays… and it showed through really well. I felt really sorry for Cole through a lot of the book. My heart really went out to him. Then again, it seemed that most of the characters were damaged in their own way… not just the obvious ones like Mear and Cole. Even though Christian had died before the novel started, I did feel that he came across almost an extra character with how much he coloured Mear’s life and perspectives. There were times I felt that the other characters took a backseat, in a way, and I kept forgetting who was supposed to be around when. There were also a few bits and pieces I didn’t understand when the characters were arguing their case. All told, although this book was dark and difficult to read in parts, I still found it a good read and it kept my attention throughout. I’d probably read other books by this author in the future.